The national symbols of Russia are a part of the cultural heritage of the country which has given the country its national identity. The official and non-official symbols play an important role in formation of a country and a nation’s image; they build up its recognition. 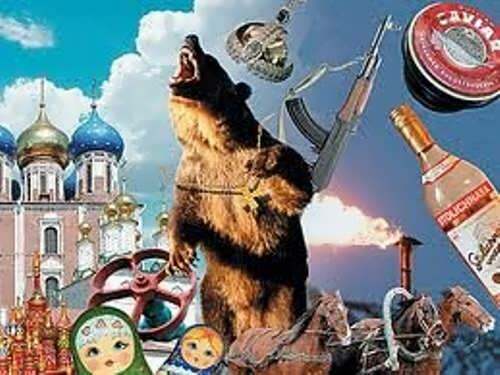 Symbols of Russia and Russians are quite diverse. There are only three official, i.e. authorized by law, symbols of the state — the flag, emblem and anthem. But there are a lot of informal symbols, which are often much more famous and popular. 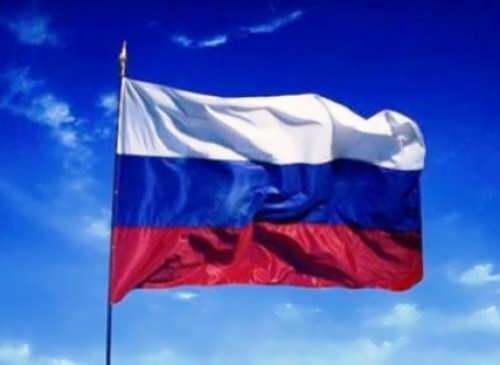 The national flag of Russia is a tri color flag-white color which lies on the top, blue in the middle and red on the bottom. White stands for nobility and frankness; blue symbolizes loyalty, honesty, chastity and scarlet represents self-sacrifice, generosity and love. 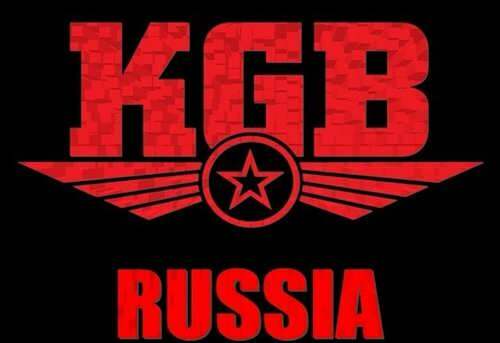 While some Russians believe that red means the land, blue stands for sky, and white symbolizes heaven. The current Russian flag was adopted on August 21, 1991 just before the country became an independent state. Most historians trace the origin of Russia’s flag to Peter the Great. In 1699, out of hundreds of different flags, Peter selected the flag similar to the flag of the Netherlands — white, blue and red flag. His design was used as a Russian maritime flag for merchant ships and then it was adopted as the civil flag of Russia in 1883. The two-headed eagle first appeared in Russia, during the time of Moscovia, in the 15th century. 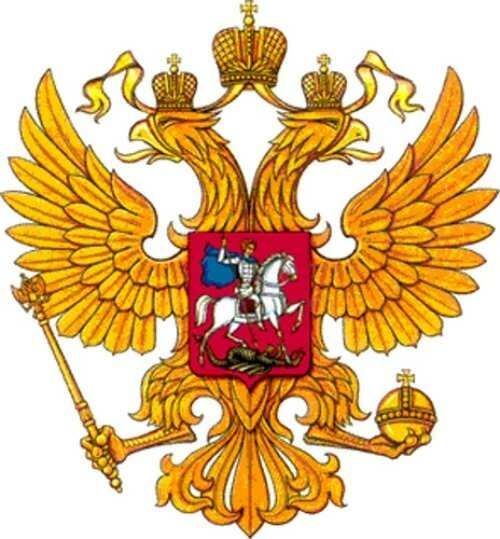 Two-headed eagle has been the symbol of the monarchy of Russia for more than four hundred years. But with the advent of Russian revolution and dethroning of the Tsar Empire, it was on the verge of extinction. 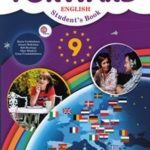 In 1993, under the initiative of President Boris Yeltsin it was again adopted on 30th November 1993. The two heads of the eagle stands for the two parts of vast Russian empire — European and Asian, which are believed to be an important part of the country of Russia. There are three historical crowns of Peter the Great above the two-headed eagle (they are symbols of the sovereignty both in Russia as a whole and in its parts). The eagle holds in claws sceptre and orb as embodiment of State power and united state. On its chest there is a horseman – Russian St. George – who is killing an evil snake with his spear. That is one of the oldest symbols of victory of Russia against all its enemies, symbol of the struggle of good against evil, light against gloom. For a long time Russia had no anthem. The various church hymns and military marches were used to honour the Russia up to 1816, when the “Молитва русских“ («Prayer of the Russians») by Russian poet V. Zhukovskii was chosen as the national anthem. The second official anthem “Боже, царя храни“ was presented in 1833, on December 25th , when the nation celebrated the expulsion of the French from Russia. That anthem existed until the October revolution of 1917 and was replaced to the new anthem of the victorious proletarian revolution — «International» — in 1918. In 1944, the national anthem of Russia was accepted. The music was composed by Alexander Alexandrov and the lyrics were written by Russian Federalist Sergey Mikhalkov. After the collapse of the Soviet Union, in 1993, a government commission and President Yeltsin offered a new national anthem “Патриотическая песня“ («Patriotic Song») by M. Glinka. However this anthem was unpopular and didn’t inspire Russians. People preferred the old Soviet anthem instead of it. 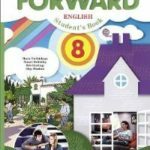 Foreigners have many stereotypes about Russian life. Matryoshka is the most famous symbol of Russia and the most popular Russian souvenir all around the World. It is a set of wooden dolls nested into each other. The painted image on them is most often a woman wearing traditional Russian costume decorated with flowers and patterns. It seems that the matryoshka has come to us from the antic world of legends and fairy tales, though in reality the wooden doll is only about hundred years in existence. Matryoshka was first made in Russia at the end of the 19th century (precisely in the 1880s), when Russia was experiencing a rising sense of culture and national identity. The industrialist and patron of the arts, Savva Mamontov, established a Children’s Education workshop where Russian folk craftsmen produced a variety of folk-art style toys for children and developed the idea of the creation of a new Russian style. Once somebody has brought a funny Japanese figurine of a bald-headed old man Fukuruma, which consisted of seven other figurines nestled one another. It was made on the island of Honshu, Japan in the late 1800s by an unknown Russian monk. With the arrival of the Russian-Japanese «Fukuruma» the craftman V. Zvezdochkin and artist S.Maliutin were inspired to create a new Russian folk art doll — matryoshka. In April of 1900, matryoshka was represented at the World fair in Paris, where it won the bronze medal and worldwide fame. The name «matryoshka» comes from the Russian word for “mother” — «мать» (the Latin root “mater “- mother). 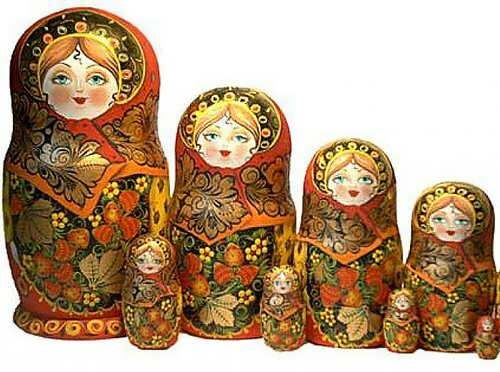 Matryoshka has come to mean “little mother” based on the idea that the largest doll holds her babies inside like an expectant mother and that each daughter in turn becomes a mother. So matryoshka is a symbol of motherhood and it has a modified egg shape. Valenki, or felt boots, are Russian national footwear. They are traditionally made of milled fleece, and each pair requires at least a kilogram of fleece that must undergo a long processing treatment. It must be combed out, made into thin strips of felt, shaped, boiled, and dried out. In the old times, the centre for valenki production was Ouglich, a small city in the Upper Volga area; currently, this footwear is made all over Russia. 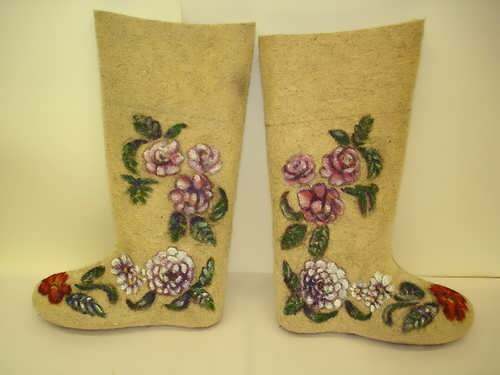 In the 18th century, felt boots were an expensive, luxury gift: Peter the First and Catherine the Great ordered specially made valenki for their personal wardrobes. Soviet leaders such as Lenin, Stalin, Khrushchyov, and Marshall Zhukov also appreciated valenki. Today, valenki are still irreplaceable as footwear in the countryside and in the army: felt can resist –40 °C (–40 °F) freeze and protect the soldiers’ feet in combat. The balalaika is a plucking string instrument that resembles a guitar, but has a triangular shape and only three strings (or two in some cases). 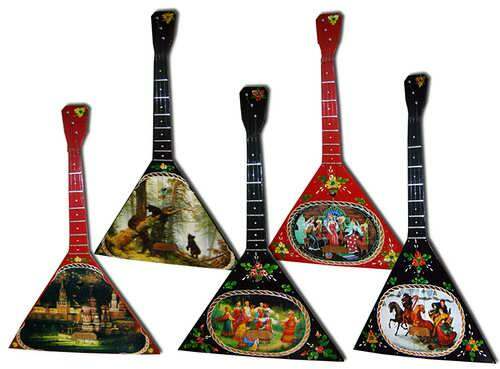 Today the balalaika has disappeared from Russians’ everyday life almost completely. There aren’t many people left who can play it – not to mention, only professional musicians in Russian folk music ensembles. 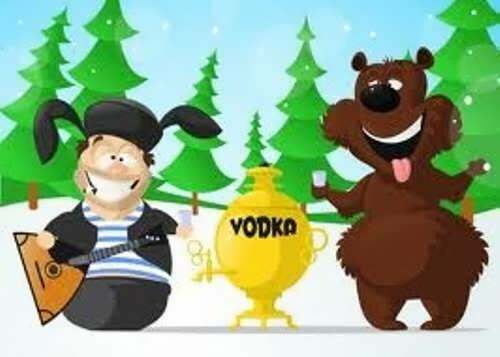 The first mention of the term «balalaika» was in a Russian document from 1688 — balalaika was used by Russian peasants, skomorohki, or wandering minstrels. It existed in various forms with triangular and oval bodies, differing numbers of strings, and movable tied-on string frets, and was mainly used for playing dance tunes. The modern variant of instrument — standardized, three-string chromatic triangular-bodied balalaika with fixed metal frets and other innovations — was created back in 1880 by Vasilii Andreev. The Russian word samovar literally means “self-boiling.” The vessel consists of a metal container for boiling the water and a fire-pan with a tube. Samovars appeared in Russia in the second quarter of the 18th century and, in the course of one hundred years, became an integral part of every Russian household, restaurant, or hotel. 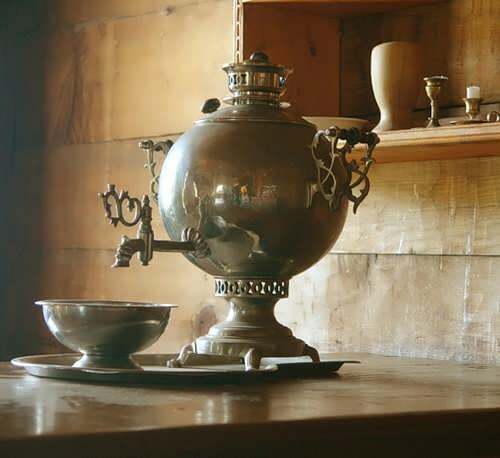 The samovar had both a practical and an emotional function: it became a unifying symbol for people when they gathered to have tea parties and provided the right atmosphere for friendly conversation. Though samovars first appeared in the Urals, the production of samovars blossomed in Tula, an old city to the south of Moscow, also famous for its armories and spice-cakes. 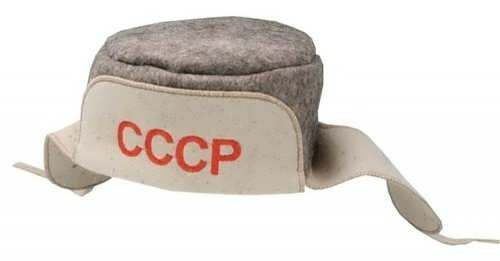 A winter hat with ear-flaps and warm covering for the back of the head can protect one against the severe Russian cold. In the past, only peasants would wear such hats — they called them the “three-eared hats.” In 1940, the Red Army substituted winter helmets with earflap hats, and since then the hats have become popular among civilians, men as well as women. Most foreigners buy black and gray military hats with faux fur, but the Russians prefer ear-flap hats of expensive natural fur: mink, nutria, muskrat, or fox. During the Soviet times, such hats were difficult to find, and state officials would wear fur trim of quality depending on their rank. One of Russias’ favorite animals is the bear, a hero of many legends and fairytales. Russians tenderly give bears the human name of Misha (sometimes adding a patronymic name out of respect — hence, Mikhail Potapych). They also apply bear-like qualities to people; a clumsy but kind person is referred to as a “bear.” The little bear cub was chosen to be Russia’s mascot in the 22nd Olympic Games held in Moscow in 1980. Bears live throughout Russia, and there are two main kinds: brown bears that are forest dwellers (the bear in those areas is also nicknamed the “chief of the taiga”), and white bears that dwell in polar areas. The popular foreign stereotypes notwithstanding, you will not see bears roaming the streets of towns and cities. 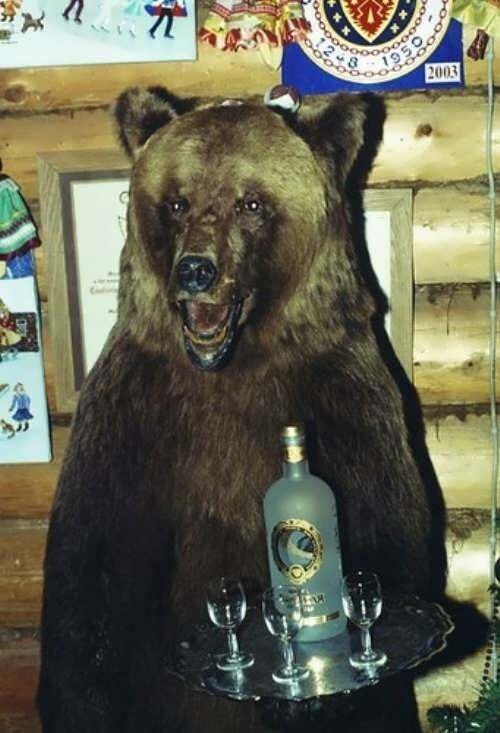 The bear has long been associated with Russia. Some western explorer discovering Russia about six centuries ago wrote of some remote town full of bears roaming the streets, and the barbaric Russian “medved’” firmly gripped Western’s imagination. So the Russian bear clich? stepped in from the West, and since the 18th century it has been mainly a derogatory image of Russian emperors (and then other Russian leaders) in Western political cartoons and caricatures. It should reflect barbarity and aggression of Russia. But we, Russian like our bears! Ded Moroz (Grandfather Frost) is a fairytale character who brings New Year’s and Christmas gifts to children every year. 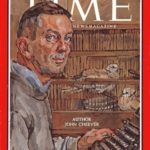 He is a big and stately older man with a deep voice, dressed in felt boots, a fur cap, and a coat that reaches to his heels. He either puts the gifts under the tree or hands them out to children himself: in this way, he is different from Santa Claus who leaves the gifts in Christmas stockings. 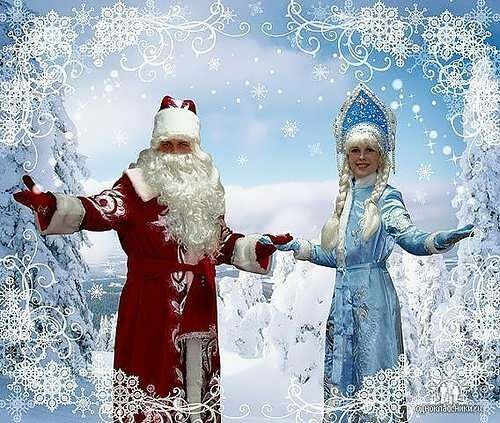 The Russian Grandfather Frost has a granddaughter, Snegurochka (the Snow Maiden), who comes with him to wish children a happy New Year. The homeland of Grandfather Frost is Veliky Oustyug, an old town in the Vologda Region. 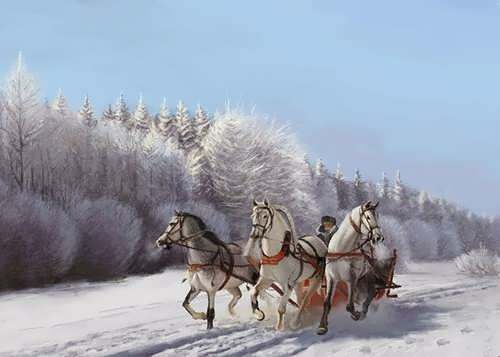 The troika is a Russian traditional triple harness, which connects the horses to sleighs, carts, or covered wagons. This troika ride has been recognized as the most spirited, fun, and fastest way to travel, and the sensations that it evokes are in tune with the Russian personality and spirit. Nikolai Gogol coined the famous phrase: “What kind of Russian man doesn’t like a spin?” The troika has become one of the most famous symbols of Russia, not to mention a favourite winter entertainment for tourists. Russia is the coldest country in the world, where winter lasts for four to five months throughout the larger part of its territory, about seven months in Central Siberia, and ten months in the transpolar areas. It is in Russia, in the Republic of Sakha (Yakutia), where the northern hemisphere’s coldest point is located: the mercury can go down to –72 °C (–97.6 °F) there. 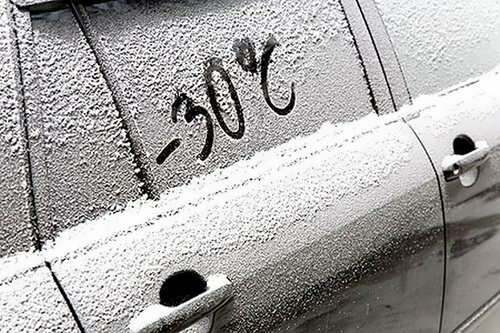 Severe frost can also be felt in Moscow, where a record low temperature of –42 °C (–43.6 °F) was recorded in the winter of 1942. The Russians are used to frosty weather, enjoying winter sports and festivities such as skiing, skating, and sledding. 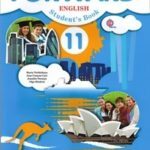 However, the severe climate does create many problems in everyday life. Buildings must be built with very thick walls to insulate them for effective heating and protection from the cold, roads must be clear from ice and snow. All of this requires money and effort, not to mention the extra warm clothing and footwear that one needs to survive the winter months. Life in Russia depended on roads since the old days. Many fairy tales are based on journeys; legends tell of hermits, pilgrims, and wanderers whom one can meet along the way. At the same time, Russians themselves often criticize their roads. As early as the 19th century, Nikolai Gogol, the famous writer, noted that “Russia’s two biggest problems are fools and roads.” Russians still use the word “road” for any type of terrain that they drive through, paved or not. Our immense country has many places where there are no people, much less roads. However, the developed areas have undergone many changes in recent years: roads are either built or are being built, though, given the enormous distances between places, building roads is no easy task. One can still wait for a letter to get from one place in Russia to another for many weeks; even express mail cannot work as fast as it does in other places. 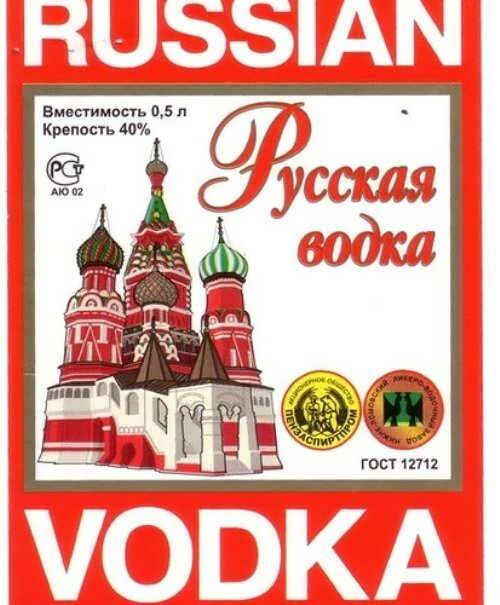 Yes, vodka is the most well-known of Russian alcohol. Yes, most Russians prefer their traditional national vodka than other alcohol (like Mexicans like tequila and Germans love their schnapps). Yes, Russians drink vodka BUT not every day – just on occasion (birthday, holiday, wedding, etc.). I was in many different countries and honestly, Russians don’t drink any more than the common Canadians/Americans, French or Germans. They drink just different products of alcohol. When and where was vodka invented? According to one of the legends, the monks of Moscow’s monastery were the first who started producing Russian vodka. After their visit to Constantinople where they tasted grape spirit, they started making the first ever hooch. As there were no grapes growing in their land the spirit was made of grain. They called this drink “aqua vitae” (Latin for “water of life” ). It was a prototype of the present-day vodka. The word vodka was derived from the word “voda” (meaning water).It by no means that Russians drink more vodka than water. And the whole myth of vodka being cheaper than water is also nonsense. According to the popular stereotypes, after meeting the bears roaming the streets, a foreigner should be escorted by (as minimum) two KGB agents. Ridiculous. During the Cold War, the KGB (the Russian abbreviation for Committee for State Security) had success recruiting agents in the United States and Britain who were known to support communism or belong to communist organizations. Since that time, the KGB-monster, “the root of all evil”, still scares Western people. Today Western mass-media created a new face of the Russian monster; it became the ex-president of Russia V. Putin who worked for the KGB in the past. 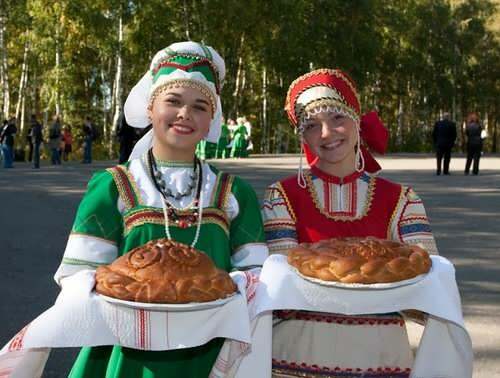 “Khleb-sol” («bread-salt”) is the most famous symbols of Russian hospitality and the oldest cultural tradition of welcoming a visitor with a round loaf with a salt cellar on top. Bread and salt represent the giver’s wish that the recipient’s pantry will always be full. Bread symbolizes key aspects of the national self-image. A special place among the cultural symbols of Russian is occupied by its architectural monuments. The development of Russian culture is inseparably linked with religious tradition. Churches, cathedrals and monasteries constructed in different centuries reflect spirituality of Russia. 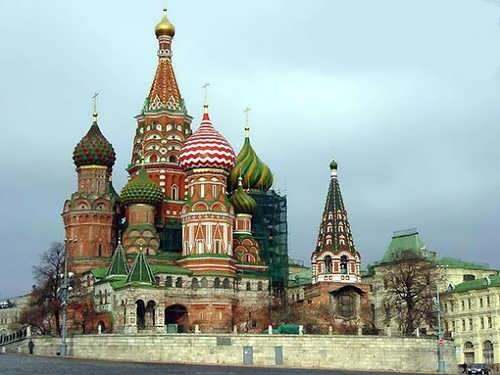 The well-known around the world such cultural symbol of Russia as Basil’s Cathedral in the centre of Moscow. One of the most important cultural symbols of Russia is Russian school of classical ballet which is considered to be the best in the world. Classical ballet came into Russia in the 18th century. By the end of the 19th century the national school of ballet had finally formed. The world-known names of Russian ballet dancers are Anna Pavlova, Galina Ulanova, Maya Plisetskaia, Michail Baryshnikov, Rudolf Nuriev and others.